When Cathleen Kahn was diagnosed with breast cancer, she taught yoga. But, it wasn’t until after the diagnosis that she understood how much yoga could help her. Kahn’s debut memoir and self-help book, “Badass and Bendy” (published by Balboa Press), illustrates how yoga eventually helped her find happiness and hope through the cancer treatment and recovery process. Written in a series of vignettes, poems and yoga flows, the book presents Kahn’s cancer journey and is specifically designed for readers touched by cancer. Intended to be read in pieces, the yoga flows are geared toward the physical and emotional challenges patients and their caregivers go through. Although it focuses on how yoga helped her through cancer, this book deals with relatable emotions for anyone and yoga flows applicable to anyone’s stress. 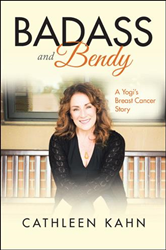 The book is available for purchase at: https://www.amazon.com/Badass-Bendy-Yogi%C2%92s-Breast-Cancer/dp/1982216328 . Cathleen Kahn is a breast cancer survivor, educator and compassionate healer who guides others to see physical fitness as a path to positive change. As a yogi, wellness expert and founder and co-owner of CatFit Yoga, she helps her clients find sustainable paths to health, happiness and self-love. When she’s not teaching, writing or speaking, Kahn loves to travel, volunteer and savor a great glass of red wine.